Red rocks are exposed in several places across the Front Range (the eastern side of the Rocky Mountains in central Colorado), such as Red Rocks Amphitheater in Denver, but the most popular location is Garden of the Gods near Colorado Springs, just a short drive from interstate 25. 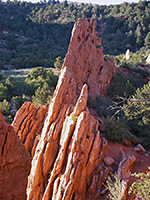 The garden contains narrow bands of red (and white) Lyons sandstone inclined at 90°, surrounded by lush green vegetation of a contrasting deep green color. The tilting of the strata was a by-product of geological uplift associated with creation of Pikes Peak (9 miles southwest) and other nearby mountains. The rocks are quite angular and eroded, and those in the Central Garden area rise to heights of 300 feet, forming several lines of thin, jagged peaks poking out of the ground like the plates of a stegosaurus. Away from here, most of the park's 480 acres contain smaller rocks and thicker undergrowth, though all the region is busy, popular both with tourists and residents of Colorado Springs, all of whom come here for hiking, cycling, jogging, horseriding, picnicking, photography and rock climbing - Garden of the Gods is recognized as one of the best, most easily accessed climbing sites in the state, and has over 100 named routes. The rocks are particularly pretty near sunset, when the colors grown in intensity, and shadows add more interest. 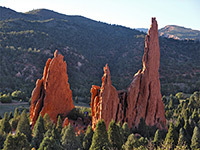 The closest hotels to Garden of the Gods are TownePlace Suites Colorado Springs (main entrance) and Days Inn Manitou Springs (south entrance). For full descriptions of nearby hotels, and a location map, see the hotel listings for Colorado Springs and Manitou Springs. 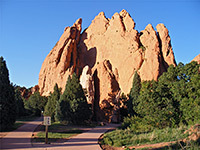 Garden of the Gods was originally a gift to the citizens of Colorado Springs by the family of local landowner Charles Elliott Perkins in 1909, who stipulated that access should remain forever free, hence there is no entry charge, despite the large amount of revenue that could potentially be generated for the city, given the large number of visitors. This popularity means that although scenically impressive and unusual, the park is not a place to go for peace and quiet, and it has many regulations; literally hundreds of notices along the many footpaths caution against scrambling over the rocks (punishable with a $500 fine), walking off-trail, climbing without a permit, disturbing natural features, and various other transgressions. Opening hours are 5 am till 11 pm (May 1 - Oct 31), or 5 am to 9 pm the rest of the year. There is no campground, but the surrounding urban area has a number of commercial sites, while free camping is available a few miles away in Pike National Forest. Several roads enter the garden (see map below). The main route is Juniper Way along N 30th St, reached from I-25 via Garden of the Gods Road (exit 146) or Fillmore St (exit 145); this starts opposite the visitor center/gift shop/nature center/cafe, and soon reaches the largest group of red formations - North and South Gateway Rock. The south entrance is on Garden Drive, at the west edge of the city near the adjacent town of Manitou Springs, though this is for small vehicles only owing to a narrow spot between two boulders, part of a short one-way section; all vehicles can exit this way, however, as the southbound carriageway is wider. The main formations in the garden are visible for some distance away across the city, and along the interstate, and the main car park is right beside the north edge of them. Juniper Way (now a one-way loop) circles this section - the Central Garden - then Garden Drive heads southwest and gives access to other areas. Parking is generally rather limited, with the right section of most roads reserved for cycling and walking, so cars can't just pull-over and park on the verge. A paved, wheelchair-accessible path (Perkins Central Garden Trail) leads from the main parking area alongside the most prominent ridge, then loops around several detached groups of rocks including Three Graces, Cathedral Spires and Pulpit Rock. Some such as Sentinel Rock aka Red and White Twins, although only around 60 foot high, provide popular short climbing routes, though most climbers focus on the taller summits. Many other trails (15 miles in total) cross the bushy surroundings, some reaching smaller, less well-known formations such as Siamese Twins, Balanced Rock and the Scotsman, but all are relatively level, well maintained, busy and not at all challenging. A trail map is posted at major junctions so there is no chance of getting lost. In contrast, the northwest section of the park has no trails, and the land becomes quite steep and more wooded, part of the foothills of the Rampart Range.